I'm back at it today with a project. We had the grandsons over yesterday, they love my tools, so we made some cards together, some budding talent there. I hardly ever make projects, so these challenges are great, they make me stretch the little grey cells. (Any Agatha Christie fans out there). This is my first Christmas project and hard to believe it's time to get going, that holiday will be here before we know it. This was a fun little bag, Project Tuesday always gives good instructions. This bag is just big enough for a couple of little tidbits or a gift card, lots of possibilities for a small gift. Supplies: Paper-DCWV The Christmas Stack, Ellison Thick Cuts-Tags, Traditional, Inks: Ranger Archival Ink-Jet Black, CTMH markers-Honey, Topiary, White Daisy, Grey Flannel, Cranberry, Sweet Leaf, Sharpie Poster Paint Pen-Gold, Stamps: See D's #50315 Fun Christmas, Nylon craft trim-gold cord, 1/16" hole punch, pop dots. Beverly you project is beautiful! 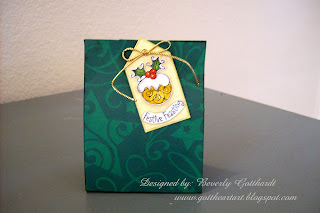 I just LOVE your box and gorgeous tag! Thanks for the wonderful inspiration and playing along with Stamps and Smiles - Project Tuesday! Fabulous gift bag and I love the tag. This is beautiful!! I love the elegance you put into the project! 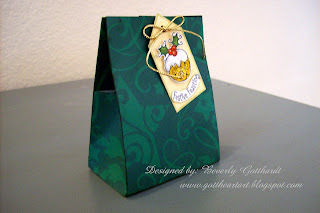 Beverly, this is a lovely little bag, I might just have to try and make one of these.